Mark Pucci graduated from Berklee College of Music with further studies at New England Conservatory. His teachers have included Rufus Ried, Michael Moore, Edwin Barker, Leslie "Tiny" Martin, and Whit Browne. He has performed and toured with Dizzy Gillespie, Woody Herman, Sonny Stitt, Zoot Sims, Tommy Flanagan, Herb Pomeroy, Richie Cole, Roland Hanna, Richard Carr, and Dave McKenna. His appearances include those at Tanglewood, Wolf Trap, Montreal Jazz Festival, Nice Jazz Festival, and the North Sea Jazz Festival. He has toured and performed in Japan, Australia, Europe, and North America. 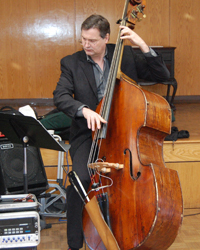 Presently he performs with the Cape Cod Symphony and was formerly a member of the Nashua Symphony. In addition to WCMS, Mr. Pucci currently serves on the faculties of Middlesex School, Berklee College of Music and the Boston Youth Symphony Orchestra.